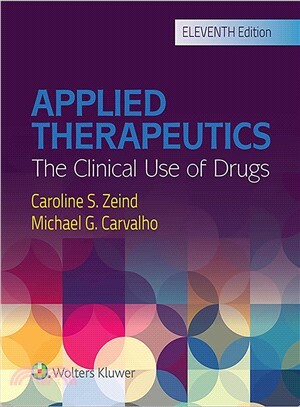 Continually revised and updated for over 40 years, Applied Therapeutics: The Clinical Use of Drugsis the gold standard for patient-centered drug therapeutics. With its acclaimed case-based approach, the Eleventh Edition promotes mastery and application of the fundamentals of drug therapeutics. Featuring contributions from more than 200 experienced clinicians, every chapter has been revised and updated to reflect our ever-changing knowledge of drugs and the application of this knowledge to the individualized therapy of patients. As you progress from the General Principles section to chapters on specific diseases, you will benefit from practical problem-solving techniques that help you devise effective evidence-based drug treatment plans. Given the evolving educational needs of students, this edition has been thoughtfully revised to align with the five Institute of Medicine (IOM) core competencies (patient-centered care, interdisciplinary teams, evidence-based practice, quality improvement, and informatics), as well as current pharmacy educational outcomes and the North American Pharmacist Licensure Examination (NAPLEX) competency statements. These strategies ensure relevance to contemporary pharmacy and preparation for pharmacy practice. Approximately 900 case studies challenge you to integrate and apply therapeutic principles in the context of specific clinical situations, cultivating the critical-thinking skills needed to optimize patient outcomes. Core Principles listed at the beginning of each chapter keep you focused on key content and direct you to specific case studies that enable you to explore critical concepts and gain further understanding of how they apply to evidence-based decision making. New chapters address important recent topics and developments. Drug interactions, pharmacogenomics and personalized medicine, and interprofessional education and practice are included in General Principles; systemic lupus erythematosus in Immunologic Disorders; developmental disorders in Psychiatric Disorders and Substance Abuse; and prostate cancer in Hematology and Oncology. In addition, a chapter has been redesigned to focus on Care of the Critically Ill Adult, which now complements the chapter on Care of the Critically Ill Child.